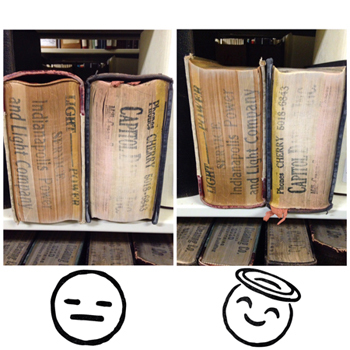 During a recent treatment, I was reminded by a librarian that it’s amusing to them that I describe conservation treatment work as making something “happy” again. To be perfectly honest, that is exactly how I see it. 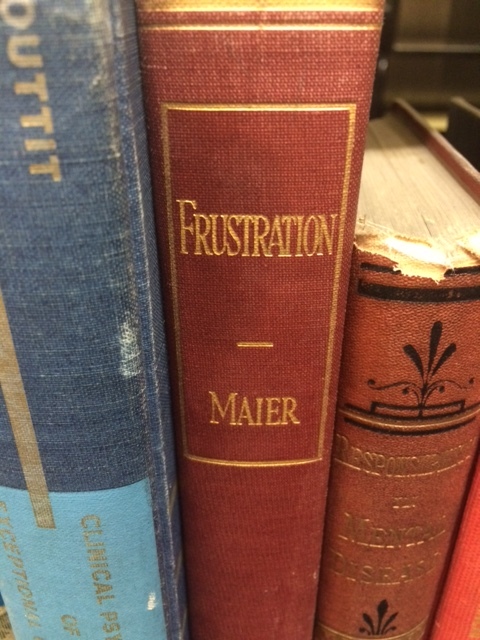 When I see something that is torn, stained, and taped within an inch of its life, it looks miserable to me. I see the potential and I can’t wait to get stuck in. 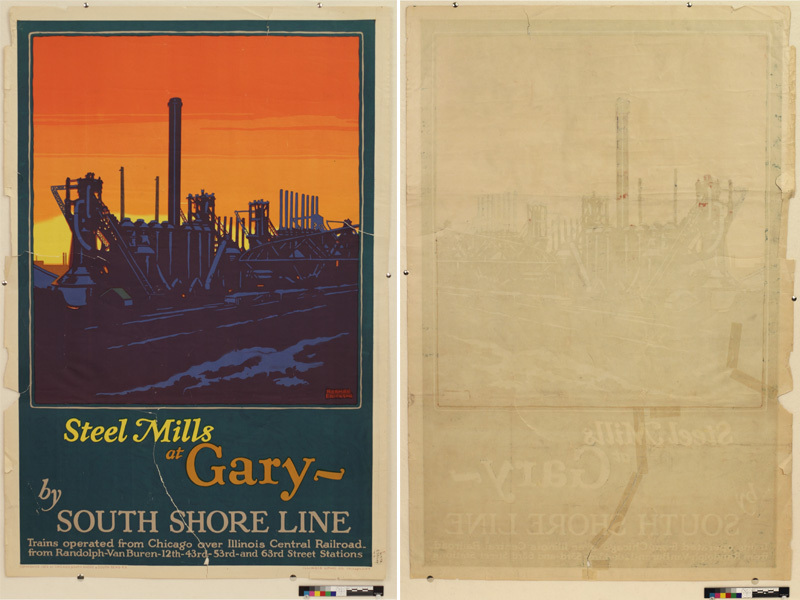 A great example of this is a recently completed treatment on one of our beautiful 1920s South Shore Line broadsides. 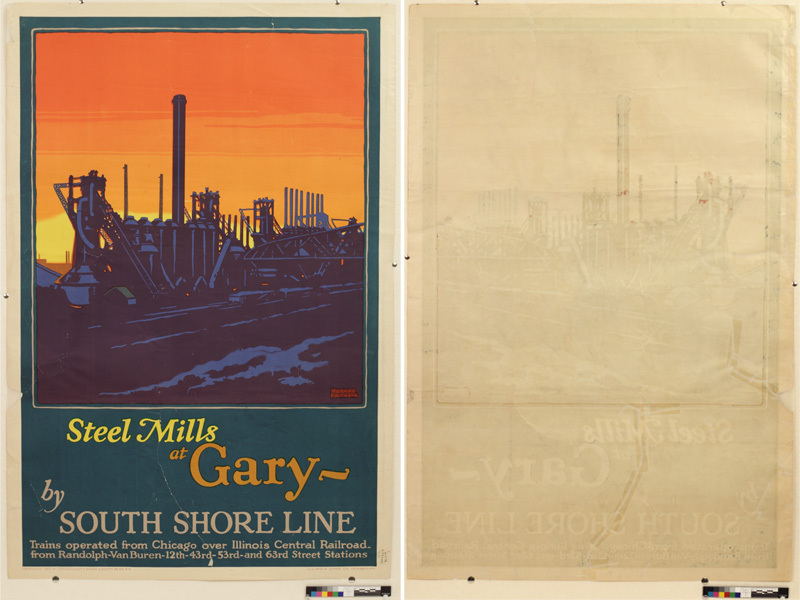 “Steel Mills at Gary by South Shore Line,” (C. 1925) had come to my attention because it will be featured in an upcoming exhibit here at the library this summer. 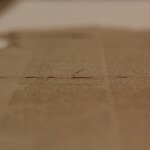 We have also been digitizing these broadsides and, in its current condition, it would have been very unsafe to do so. With a large disfiguring tear down the front and several edge tears, creases and losses, this broadside just looked uncomfortable. 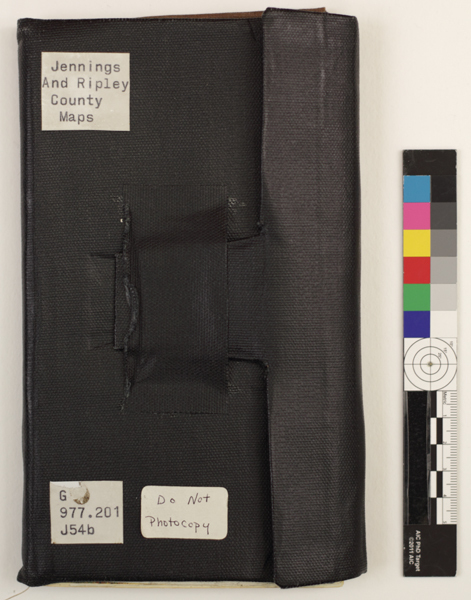 As you can see on the back, an enterprising former employee had attempted to mend this posted with one of a conservator’s most-dreaded nemeses: tape. 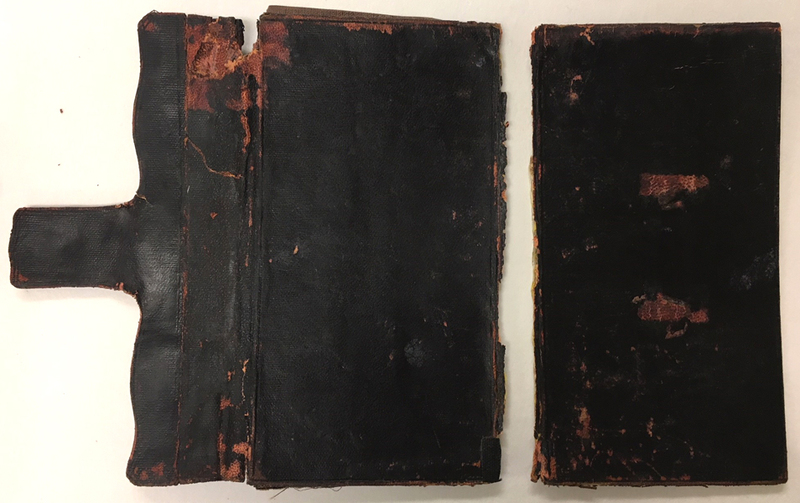 This mending job had also not quite lined up the tear carefully enough, causing the main disfiguring problem: bumpiness in the overall surface (or as we call it in fancy conservation terms, cockling and planar distortion). The edges definitely held promise because I could see that much of what appeared “lost” at the front had actually just been torn and folded over onto itself. With careful work, it could be made happy again! 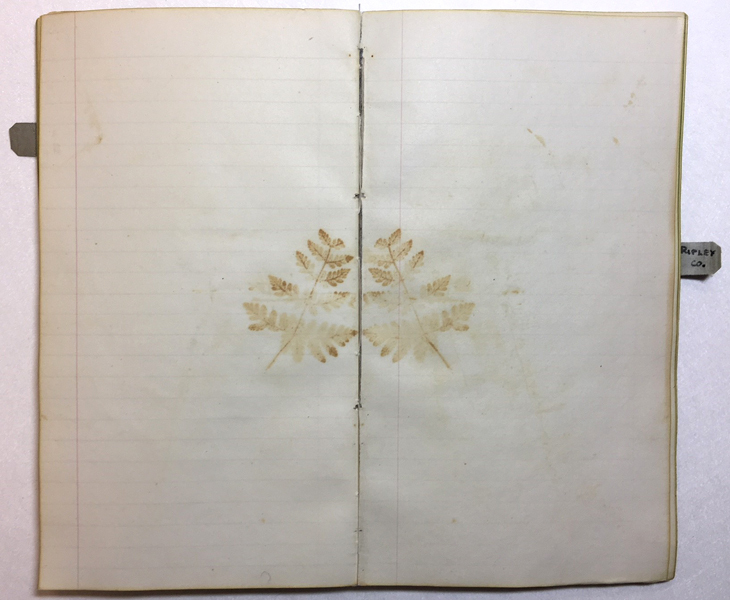 Self-mending flap tears, where the paper has torn in a way that overlaps itself and can be mended to itself, sometimes without Japanese paper needed. 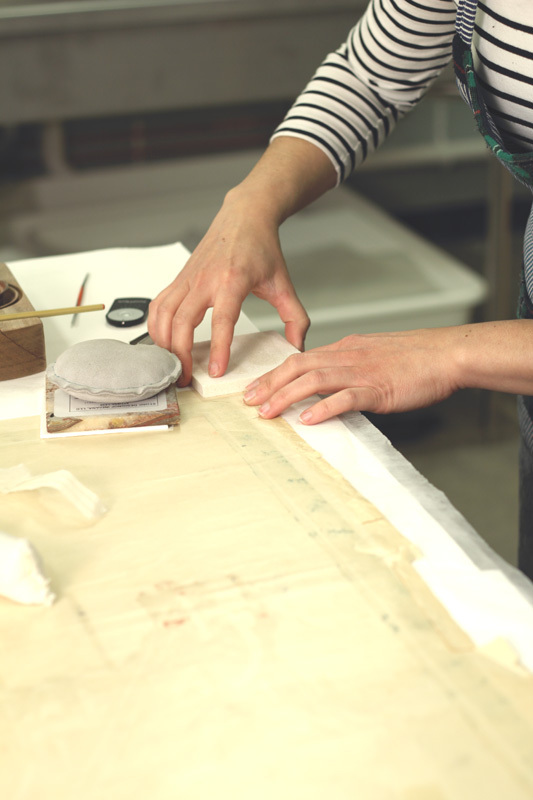 Encouraging folded edges to lay flat again with the use of localized humidification. 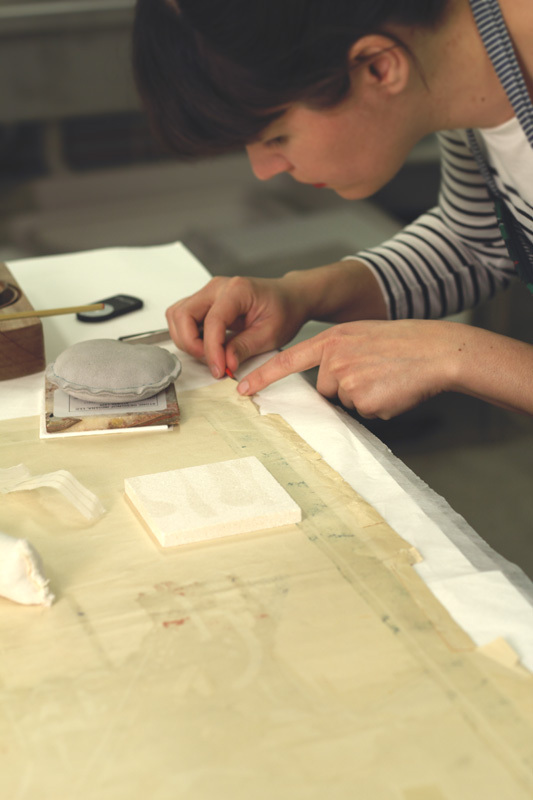 Using gentle pressure to encourage folded edges to lay flat. This broadside looks much happier and can now be safely exhibited, digitized, and accessed by our patrons. A very satisfying treatment, indeed! 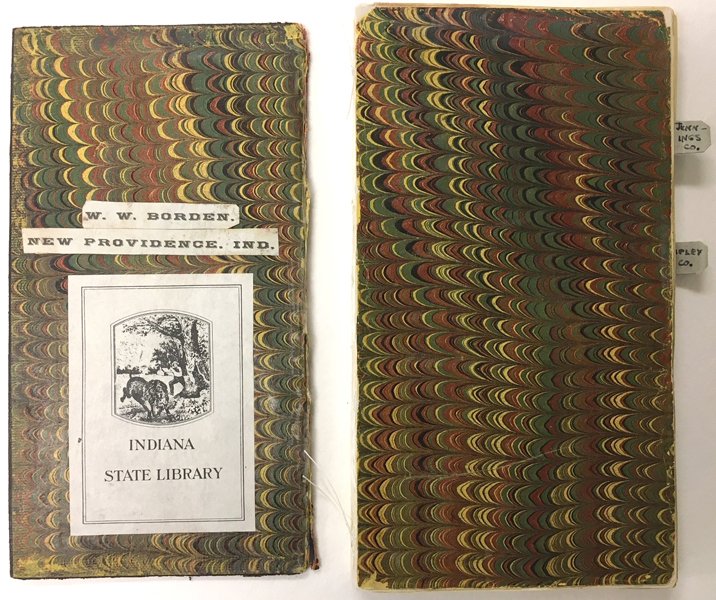 This broadside is part of the Rare Books and Manuscripts Broadsides Collection at the Indiana State Library. Please note that colors presented on computer screens are not precisely accurate, and may look slightly different from one screen to another. 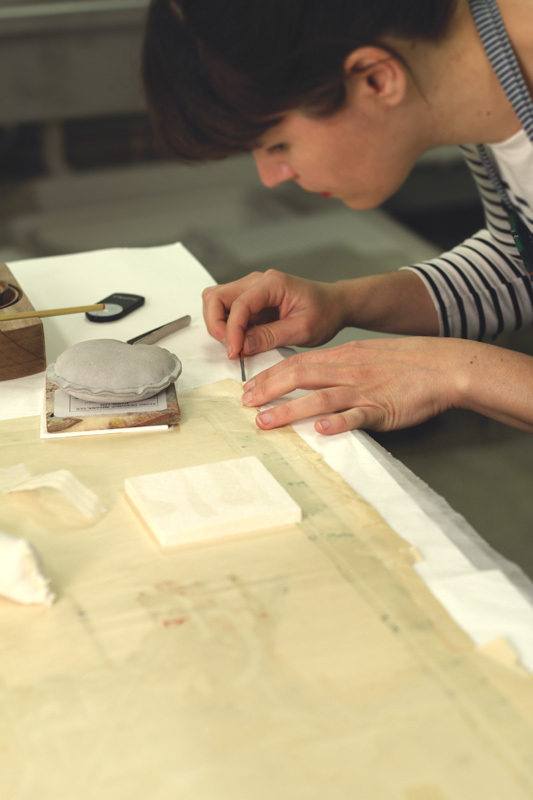 Several large-format atlases are currently waiting in the Martha E. Wright Conservation Lab for their custom-made boxes to be made. 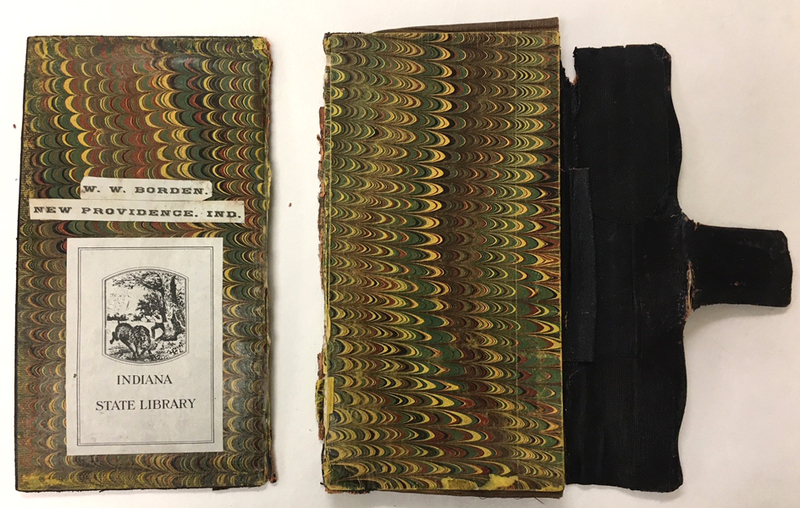 Within these atlases are hundreds of beautifully hand-painted engravings of specimens observed by the scientists aboard the naval fleet charged with surveying the Pacific Ocean on the United States Exploring Expedition. This expedition, often called the “U.S. Ex. 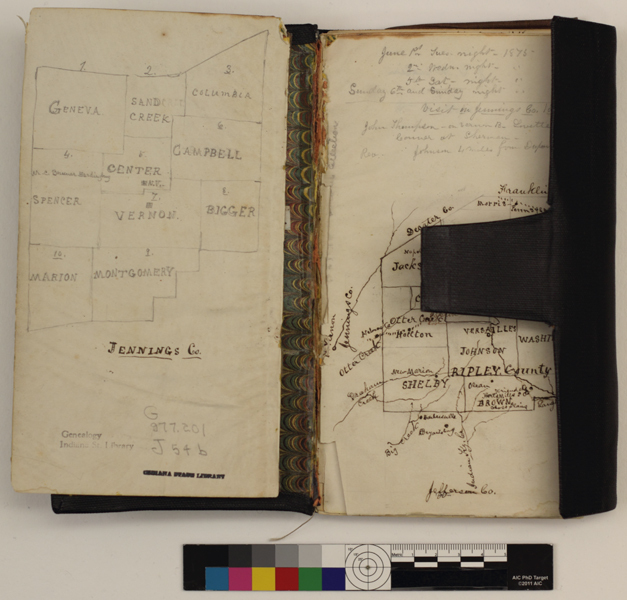 Ex.”, sought to document everything from the charting of lands and oceans, the description and illustration of flora and fauna, and the anthropological study of peoples encountered on the journey. To read more about this highly influential expedition, we recommend giving this Smithsonian article a read. As October is the spookiest month of all, we thought we would share some of the more “frightening” animals depicted by John Cassin, an American Ornithologist, in the United States Exploring Expedition’s Atlas. 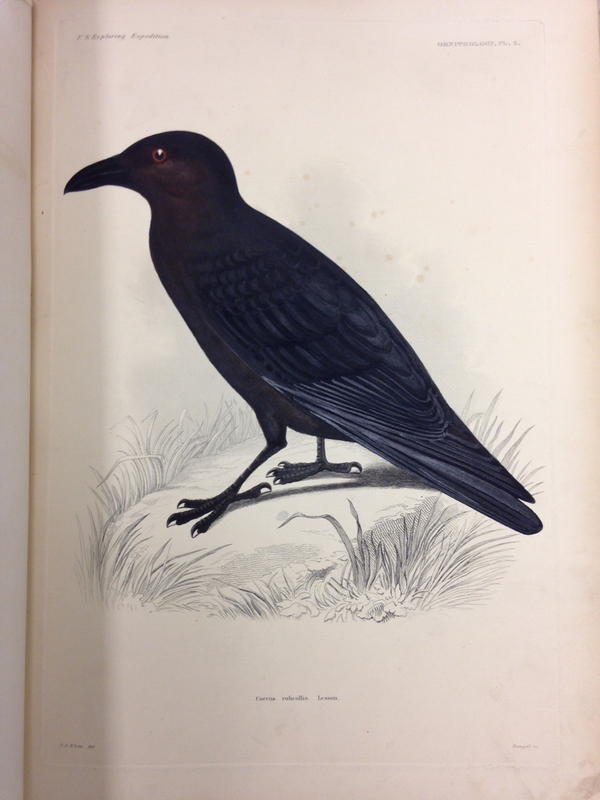 Mammalogy and Ornithology, 1858. Ornithology, Plate 5: Corvus ruficollis (Brown-necked raven). – The blacks used on the feathers reflect light when viewing the plate from different angles. This is a wonderful example of how important it can be to see a real item in person for the full experience. My name is Crystal Ward, and I am a librarian in the Genealogy Division. 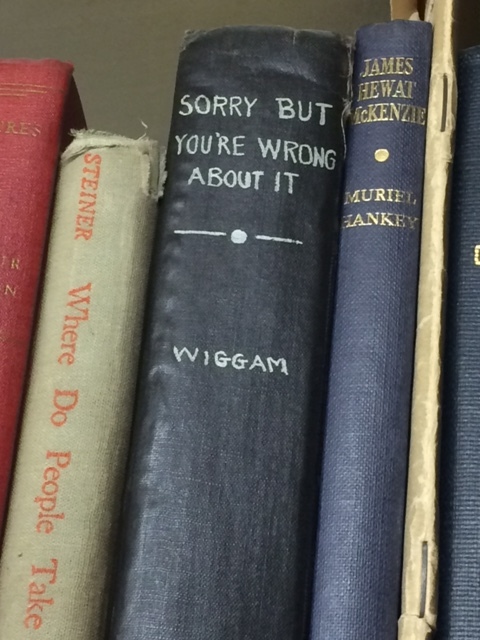 I have been asked “what does a genealogy librarian do; what is your job like”? 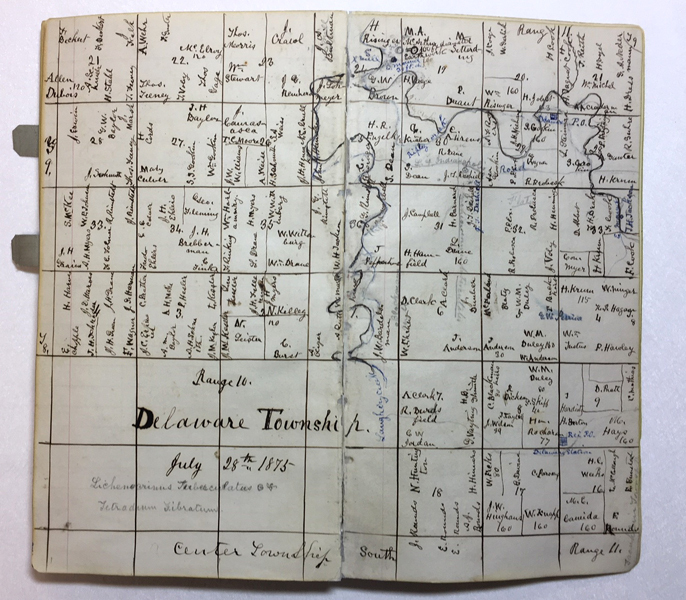 As a genealogy librarian, I work to preserve the family history of the citizens of Indiana, and to ensure that the items we collect are preserved and protected for use by future generations. 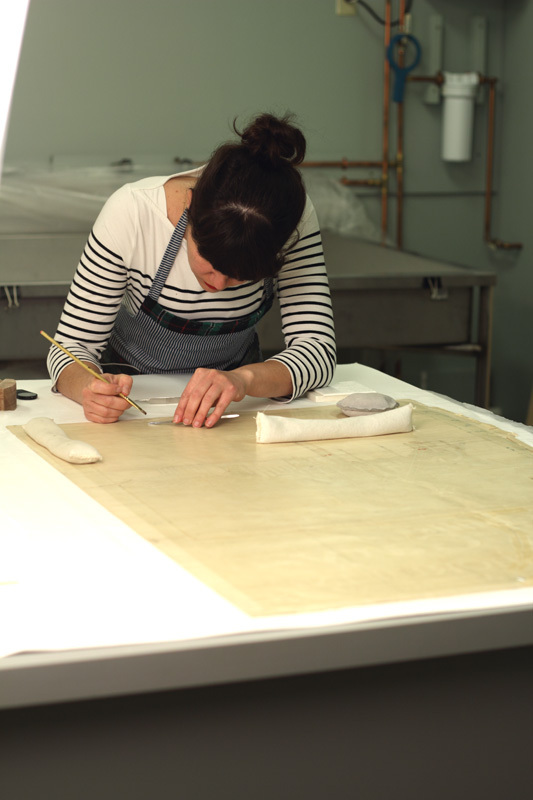 One often overlooked factor in librarianship: preservation and conservation, environmental control; or more specifically, dusting, is one way that I help conserve the materials that we have in the collection. 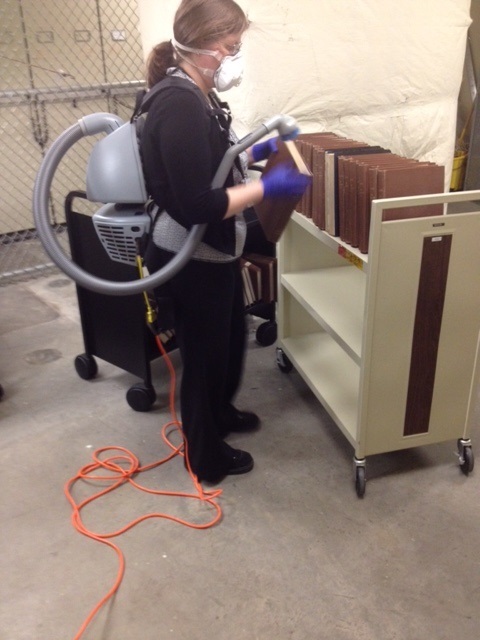 Yes, like housework, librarians dust the books in the collection to keep them in good shape. By cleaning books and book shelves of dust, dirt, and debris, we are creating a happy and healthy environment for the books. This is not a simple task, and comes with certain tools. 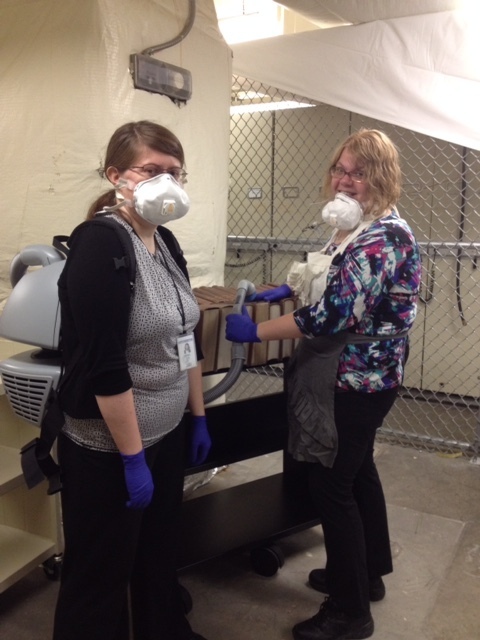 For example, when I clean my assigned section of shelves, I wear an apron, rubber gloves, and a dust mask, as in the glamorous photos above. I use a special brush with horse hair bristles, a HEPA vacuum cleaner, and I always have my iTunes playing. I will spend up to an hour cleaning and dusting one section of books, and this task is made more enjoyable by my iTunes playlist. 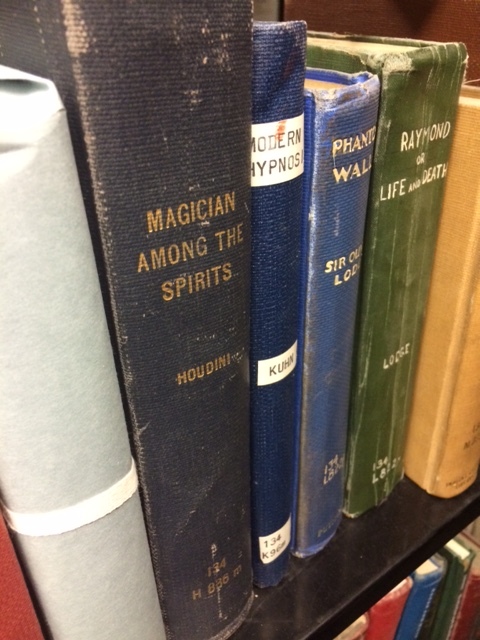 While cleaning a section today, I played several songs by the Beastie Boys, “Float On” by Modest Mouse, and Will Smith’s “Summertime.” I also run across some really amazing books and often keep my eye open for unusual titles. 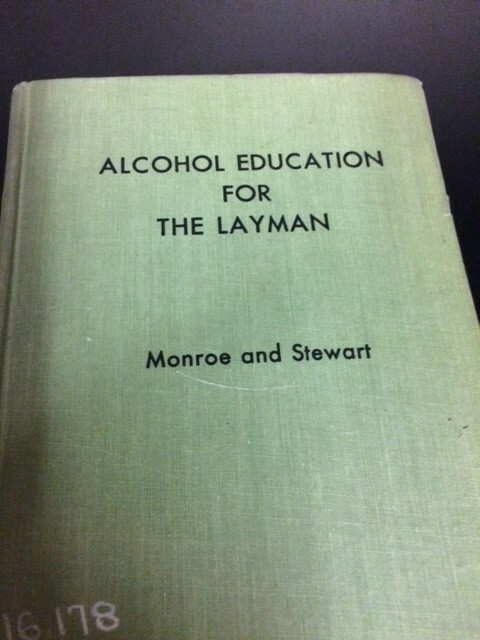 I was not disappointed in the titles I found while dusting today: “Magician Among the Spirits” by Harry Houdini, ISLM 134 H836N; “Alcohol Education for the layman” by Monroe and Stewart, ISLM 16.178 M753A; “Sorry but you’re wrong about it” by Albert Wiggam, ISLM 133.7 W655s; and “Frustration: the study of behavior without a goal” by Norman Maier, ISLM 132M217F. Today’s solar eclipse over Europe brought to mind a unique atlas recently exhibited in our Exhibit Gallery here at the Indiana State Library. 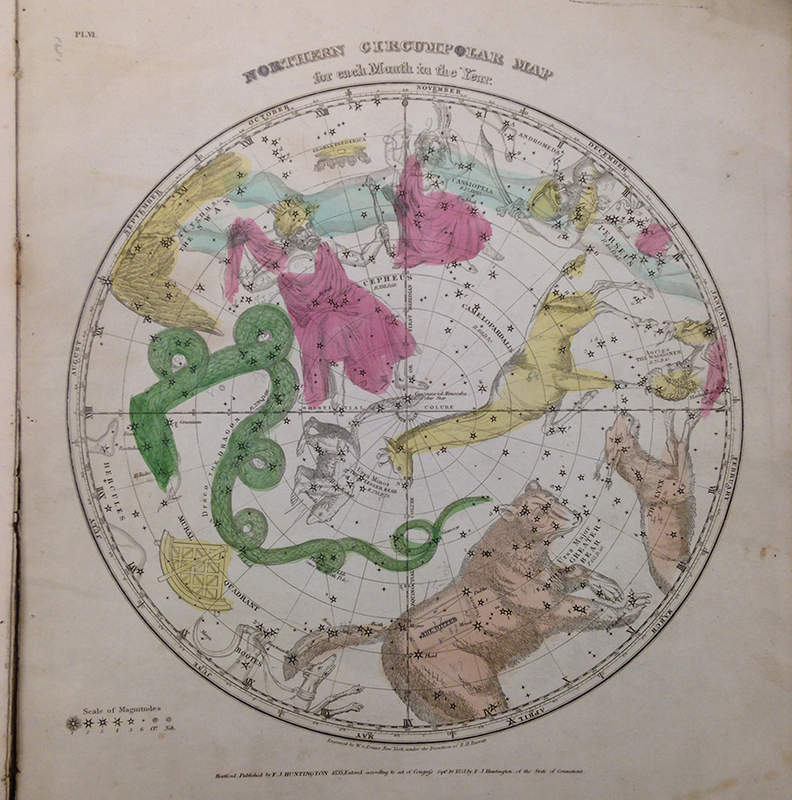 Elijah Burritt’s 1836 Atlas, Designed to Illustrate the Geography of the Heavens features beautiful hand-colored renderings of the celestial bodies as seen from the Northern Hemisphere at different times of the year. 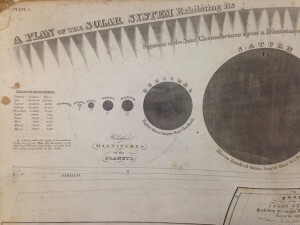 It also includes a map of our known solar system, circa 1835. I stopped in my tracks, however, when I spotted a planet called “Herschel”. This interesting find turned into a brief but amusing lesson in the history of the planet Uranus. Discovered by William Herschel (1738-1822) in 1781, discussion was still ongoing about what to call the new planet when this atlas was printed. While Hershel wanted to name the planetary discovery “the Gregorium Sidus” (or, “The Georgian Planet”) after King George III, others in Europe were likely not convinced they wanted to permanently name a planet after an English king. 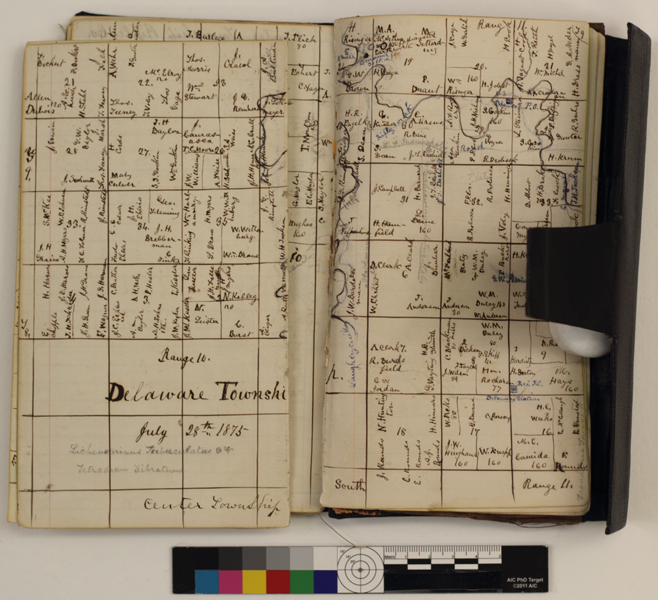 At the time this atlas was printed, Uranus was still being referred to as “Herschel” after the man who discovered it. It was not until the 1850s that the name Uranus, after the Greek god of the heavens, came into common use. 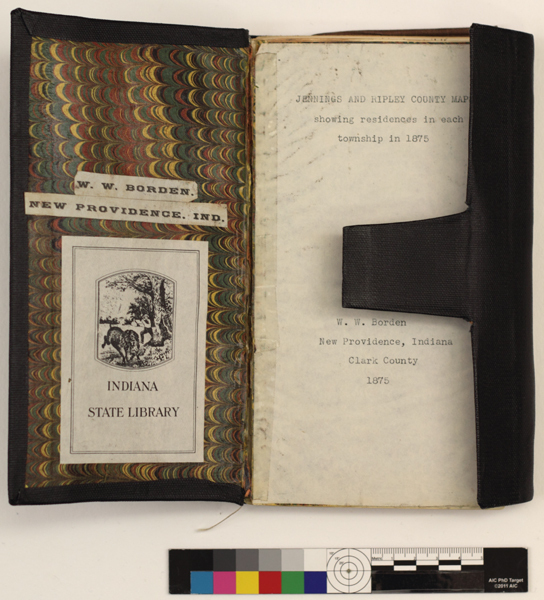 The General Collections of the Indiana State Library feature some unique and fantastic holdings from the history of art to zoology. If you have a unique or specialized area of research, please contact the Indiana State Library at (317)232-3678 or “Ask-A-Librarian” at http://www.in.gov/library/ask.htm. You might be surprised what you’ll find!